Re: County Board of Supervisor’s vote to partner up Santa Barbara and Ventura county to do a feasibility study on Community Choice Energy the vote was 3-2 in favor of the study. “Four years ago a handful of community minded leaders came together to educate our political leaders about Community Choice Energy. Today, the County Board passed a resolution to Explore this powerful tool. Thank you everyone that has offered a kind word or encouragement and came out to support this vision. It has helped sustain the hope that made today’s vote possible. We are creating a beautiful future for SLO County.” Scott Mann. To SLO Clean Energy that has kept this issue alive and well for 4 long years thank you, thank you, thank you. Power of loving, caring people rules!!!!! Let them know. Next up is the Planning Department’s hearing on Oct 22nd to extend an expired 10-year-old conditional use permit on 31 outdated, outmoded, oil wells at the Arroyo Grande Oil Fields. Our letters and input made a difference and the planning department is taking another look at the issues we raised. We are going to make it very easy for them to do the right thing. It’s simple. This is all about keeping our water, air and living environment safe. So, until and when the applicant, Freeport McMoRan, can produce all the proper and necessary certified documentation signed, sealed and delivered to the Planning Dept. with an official stamp from the agency in charge of issuing certification that officially recognizes the Freeport project meets all the health and safety standards set by the Clean Air Act, the Clean Water Act, The Safe Drinking Water Act and the California Constitution Article 10 section 2, the project is denied. It’s just that simple. Official is a driver’s license, passport, birth certificate, death certificate, health certificate, liquor license, notice to appear, we all know what official looks like. Have seen nothing that looks even remotely official as to meeting safety and health standards. It’s just that simple. Officially certified as safe. Permission to extract limited scarce water from the local protected aquifer and dispose of the toxic, hazardous, known to cause cancer, by-product into the ground is denied. It’s just that simple. Did you know our Board of Supervisors, planning Dept approved SLO County as an official toxic waste disposal site? Me either. I don’t think we are. So, until those documents can be produce permit to dump toxic waste into our back yard is denied. It’s just that simple. And just for the record this community reserves the right to refuse to do business with any entity that refuses to meet all the State and Federal Health and Safety standards set by law in the Clean Air, Water and the Safe Drinking Water Acts and California State Constitution Article 10 section 2. It’s just that simple. Another local group of residents that are adjacent to and have been and are being directly impacted by the activities at the Freeport facility are organizing and speaking out. We are joining together and speaking as one. We all want safe. 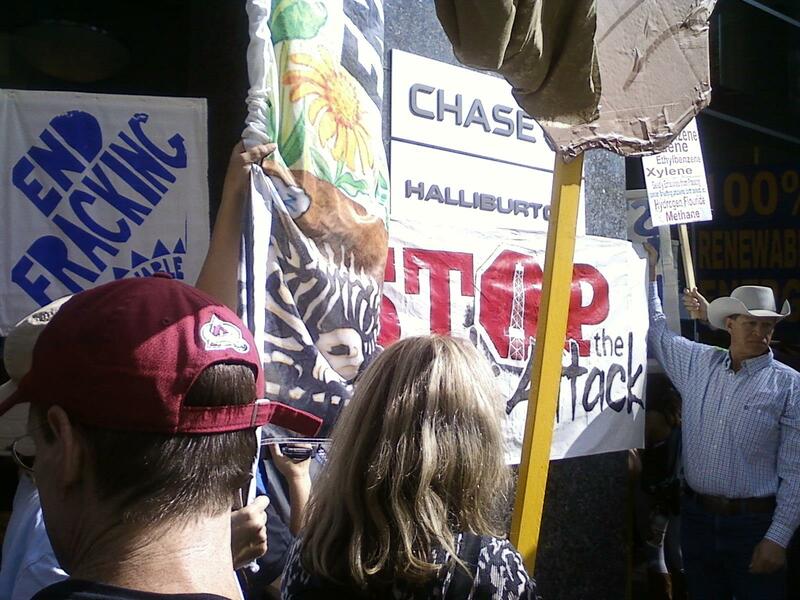 I had occasion to attend a Stop the Frack Attack workshop and rally in Denver Colorado over the week-end. We stopped off at the Halliburton headquarters to deliver a message. The message is: We are done with you Halliburton. You stink. We don’t want your smelly, stinky, ugly, dirty, noisy, sickening, toxic, dangerous oil drilling rigs in our back yard any more. We want something better. We deserve something better. We have something better. It’s clean and safe. Hello Sun and Wind. Good-bye dead and putrefied. It’s over Halliburton. You are a waste of space. No more for you. Will get talking points off to you all in the next couple of days. This entry was posted in All, Events, Newsletter, San Luis Obispo County, Updates and tagged Board of Supervisors contact info. Bookmark the permalink.